Let the good times roll… again! This ain’t your father’s automobile, or your older brother’s for that matter, but the emergence of The New Cars, comprised of original members of The Cars. Joining Elliot Easton on guitar and Greg Hawkes on keyboards, will be an all-star group of rockers in Todd Rundgren, fellow Utopia bassist Kasim Sulton, and Prairie Prince, former drummer for The Tubes. The Cars’ initial success was immediate. 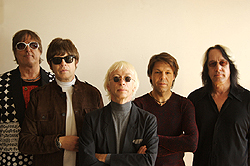 The Boston-based group’s demo version of “Just What I Needed” was the first single from the band’s debut album, The Cars, which reached #3 on the Billboard Pop album chart upon its release in 1978, and produced further hits such as “My Best Friend’s Girl” and “Good Times Roll.” Under the guidance of ace producers Roy Thomas Baker and Robert John “Mutt” Lange, a string of smash albums and singles followed. The 1979 sophomore release, Candy-O, went Top 20, producing the hits “It’s All I Can Do” and “Let’s Go.” Panorama, in 1980, cracked the Top 5 on the strength of the hit single “Touch and Go,” while the Top 10 release Shake It Up produced the title track hit and “Since You’re Gone” in 1981. It’s been 17 years since The Cars last toured. Since then, bassist Benjamin Orr passed away from cancer, and, despite discussions over the years, lead singer Ric Ocasek and drummer David Robinson have decided not to participate in a reunion. But that hasn’t stopped Easton and Hawkes, who have longed to get back on stage and play, getting their New Cars band mates all lubed up and ready to roll once more! With a new CD out from the New Cars - a live album comprising of the greatest hits of The Cars along with new material - they are also embarking on a headlining tour to round the year off. Chatting recently with keyboardist Greg Hawkes, we discussed music from old to new, from beloved old memories to exciting new possibilities ... and quickly found out that it's now time to let the good times roll ... again! When the idea for a New Cars first came to mind, whose mind did it come to, when and was it taken seriously at that time? "Boy, now that's a question," he laughs. "I can't exactly say. There's been a couple of attempts in the past. We had been talking about it for a while, all four of us. It sort of went from there and just sort of evolved into a different line-up when it became apparent that Ric and David didn't want part of it." "Mainly Ric was more interested in producing than performing and we had been talking to David as well. So, out of all that somehow Todd's name came up. Elliot had talked with him, because Elliot had worked with him in the past on a previous Todd production. And so to our surprise he was interested in the idea." Was he the only name that came up as a serious choice? "He was the only serious one, yeah." Did you ever consider doing a reality show such as 'Rockstar: The New Cars' to find a new lead singer?! "No, but it's funny 'cause I kinda joked about doing a reality show that include just conference calls between manager's and stuff," he laughs. "But no, only in a joking way." Being that this is also a Supergroup, couldn't you guys have just gotten together to play live and been called something completely different?! "You know, it has been somewhat discussed and it may evolve into more than that with any luck. That would be my hope." So, for right now you're looking at this new group to sustain some Cars musical stability? "Yeah, if possible. When the first Cars were around I had no idea how stable that was gonna be!" When you reflect back on those early days was music taken more seriously, perhaps? And, just what was it about your music that enables it to stay lovingly with us today? "Yeah, I don't know. But you're right, there's certainly some kind of longevity to a lot of The Cars songs." Being that you guys have been together for over 40 years now, rather like a marriage of that length I'm sure it's not been the smoothest ride all the way?! "No, no. A bit bumpy," he laughs. So, what has kept you together? "Boy, I don't know," he laughs. "Yeah, there were plenty of times where I figured I'd never be doing this again. And yet here I am still, in spite of the odds," he laughs again. Knowing that it's been 17 years since you last toured as 'The Cars,' what are you finding to be the major changes in preparing and actually playing live again? "I just think with a certain maturity you see things a little calmer. They're not as crazy. Not as stressful." Taking you personally back in time, you seemed to bounce from group to group back in the early part of your career. Bands such as Teeth, Orphan, Milkwood! "Wow ... wow," he exclaims. "You've really gone way far back. Well, the first band that I was ever in was called The Aardvarks, that was before Teeth. Boy, I don't know why I didn't hang long. I just seemed to be on the move a lot back then," he laughs. Was it a simpler time back then to be able to move from one band to the next without causing a media hoopla? "It probably was, in a way. I mean, it's funny it's like so different now. Back when I was first getting started I was really inspired first by The Beatles. So, I've been a big Beatles fan ever since I was 11 years-old back in 1964. I don't know. It just seemed like bands were a lot more important back then and the music was a lot more influential. Everything was just more important, culture wise." "Even the size of things. Like, we used to carry around record albums, 12"x12" so that you could say, 'This is what I'm listening to.' And then it's slowly gotten shrunken down to CD size or even smaller. And now it's becoming even more anonymous in a way, becoming files that you download. It's just a funny world, that's all," he laughs. Talking of record sleeves, whoever thought of asking Roberto Vargas to create Candy-O for you was inspired! "Yes, that was David Robinson, The Cars drummer. That was all David. David looked him up and proposed the idea to him and that was that." Back then though that was very indie of you to steer away from a band photograph on the front cover. Did it feel like that to you guys also? "Well, I don't know as it was really all David's idea. He had done a design for the first album which really ended up being used more for the inner sleeve of that. But, with the success of the first album we sort of had a little more power that he ended up doing the art direction for the second one." "But, to their credit I think Elektra thought it was a great idea also and they fully supported it." When driving in your car, which one Cars song do you enjoy listening to the most and which one do you turn the station on as quickly as possible?! "Boy, the one I would change would be 'All I Can Do.' Yeah, usually so. There's something about that song that rubs me up the wrong way. As for one that I enjoy, maybe 'You Might Think.' That's one of my favorites." Is there one solitary Cars memory that really personifies why you got into the business all those years ago? "You know what just came into my head was that after the first record came out, the first time we played in San Francisco we were just starting to bubble up there. And in the audience there was Neil Young and Paul Kantner and all I could think was, 'Wow, these guys are coming to see us! That's pretty cool.' And that's sort of why I wanted to be in a band in a way. I just loved the stuff that guys like that would do. It was wicked cool," he laughs again. If you would like to win an AUTOGRAPHED copy of The New Cars' 'It's Alive!' CD, and you think you know all there is to know about the band, just answer this easy question: Who introduced The Cars on stage at the 1985 Live Aid concert at Wembley Stadium in London? !